So I’ll begin this post with a little fact about myself . I am a Cancerian – Leo cusp by birth and those who know me say I’m a Cancerian more than a Leo (except when I am raving mad ) I’ll be a tad honest with that. Cancerians are warm souls and love to stay home, entertain guests, cook, love and do most things that are close to the heart. The kitchen is our space for creativity and pleasing people with our food is something we crave for. At least in my case. Baking, cooking and expressing our creativity are our biggest passions and nothing pleases us more than a crowd saying “we loved that” (and sometimes “we love you”). So for those of us who are willing to spend more than half our life near the oven and doing rounds of the kitchen, trying recipes that are family favorites and people pleasers, here’s a recipe that has to go down in your collection, whether cancerian or not, this is a people favorite. I have not heard anyone saying they hate garlic bread and then Parmesan just adds that special touch. Promising to never disappoint, here’s my version of my new favorite dinner side. In a small bowl, add yeast granules to slightly warm water along with sugar and stir until the granules dissolve and keep aside in a warm place for the yeast to activate. You will know the yeast is ready once the mixture turns frothy. In a stand mixer with a dough hook attachment, add flour, salt, sugar, butter and water and mix on low speed. As the mixer is on add the frothy yeast mixture and increase to medium speed. Continue mixing the ingredients with the dough hook until it comes off the edges and comes together as a dough ball that’s smooth on the sides. On a dusted surface, pat down the dough from the mixer bowl and shape into a round ball. Cover with an inverted big mixing bowl and allow this to rise for about 20-30 minutes or until doubled. Once the dough has doubled, divide into balls of equal weight. I took mine to be 40 gms each and place on a baking tray brushed with oil on the surface. Place each dough ball with sufficient space in between as they increase in size while rising. 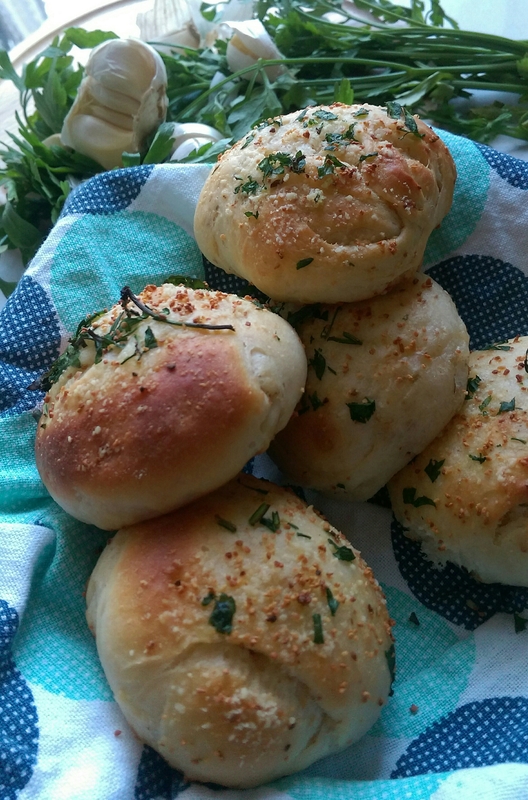 Place a damp cloth over the dough rolls and allow to rise until nearly double in size. In a small mixing bowl, mix together garlic granules or powder, parmesan cheese powder and freshly chopped parsley. Since this will make your topping for the bread you can alter the quantities required as per your liking. Once the dough balls have risen and nearly doubled in size, gently spread topping mixture on the top. If you find the topping dry and slipping off the dough balls add a bit of oil to the mixture. This will ensure it will stick through the baking as well. Bake in the oven at 220℃ for about 20-25 mins or until golden brown. You can brush these rolls with butter once removed from the oven, make sure it’s done while still warm. 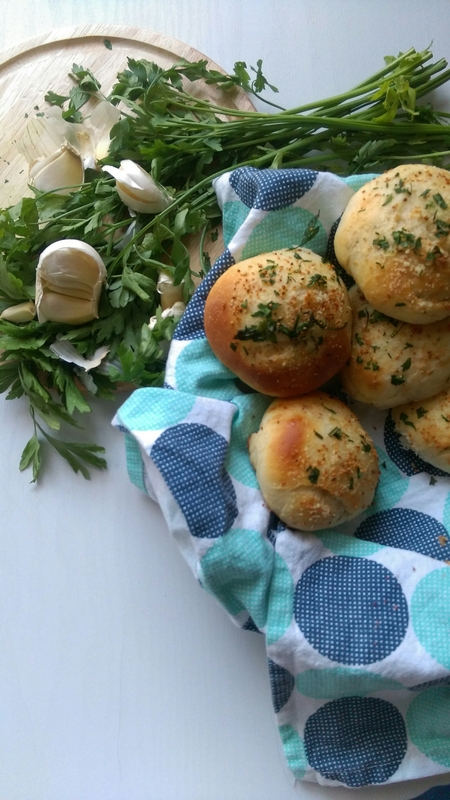 This is the simplest way I like to have my garlic bread and it’s done so quick and easily, making it my go to bread recipe for any occasion or simply an evening entertaining guests at home. Until my next post Happy Baking! Follow me on Instagram too @annaceta89.